Naturally, we’re starting off with a guy who recently benefitted from this world’s very first wheelchair. Bran hasn’t done much this season other than freak out his sisters and ask to speak with Jon Snow (even though his magic powers should give him the ability to know where Jon Snow is at any given time), so hopefully he’s about to drop some huge reveals in this scene. Here’s Cersei, a woman who knows a good chair. She looks worryingly happy in this picture, which can only mean bad things for the show’s “good guys.” Plus, there’s even a chair in the background, almost like it’s looming over whatever’s happening in this scene. It’s a metaphor! This image of Sansa looks like it could be the back cover of an emotionally devastating solo album. It doesn’t tell us anything about the episode, but you know these tracks are going to be pretty sick. Other than fail to save his sister and stand by while a bunch of people get killed, Theon also hasn’t done very much this season. This image doesn’t look particularly different from his last appearance on the show, so maybe he’ll continue to not do very much. Here’s the Wolf himself, making his worried/confused face at what appears to be the big Lannister meeting that was mentioned last week. Note the chair beyond his shoulder, almost like he’s trying to push away the demands of being a leader. He doesn’t want a chair, but a chair wants him. 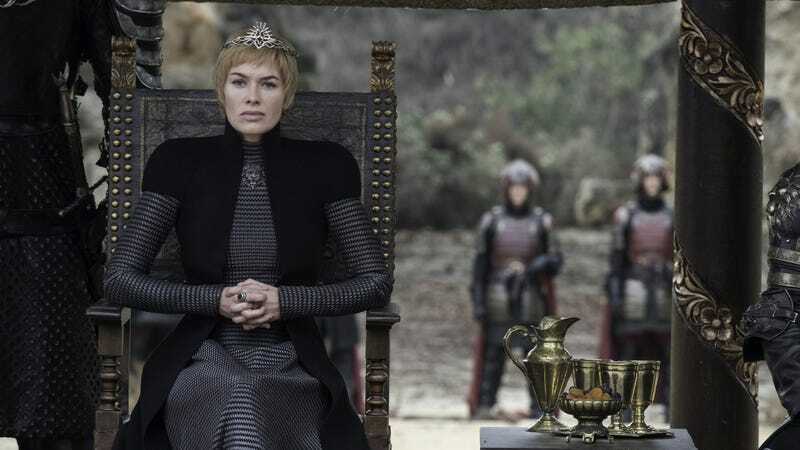 Compare that to this shot, with Cersei sitting on a comparatively grand chair while Jaime—her brother/lover/most trusted knight—is on what looks like a glorified stool. Cersei believes that she’s the only one who deserves a chair, and she wants everyone to know it. Perhaps this rudeness will finally be the thing to convince him that his sister is super evil. No chairs here, but could this be a third Jon Snow face? Up until now, he’s only been worried/confused and angry/confused, but this looks like angry/worried. Tyrion doesn’t seem as concerned, so whatever’s happening can’t be too bad, but a third facial expression from Jon Snow would be even more shocking than last week’s ice dragon. It’s not clear when these final two shots take place, as it could be before or after Cersei’s meeting, but Bronn and Jaime aren’t happy either way. If this were a Star Wars movie, Bronn would be saying that he’s got a bad feeling about this.